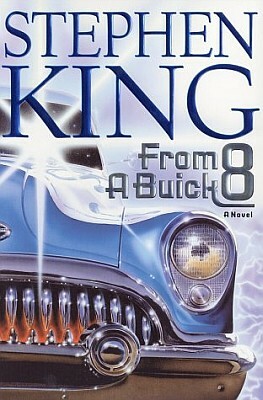 From a Buick 8 (2002) is a Lovecraftian dark fantasy as interpreted by Stephen King; the big, cosmic ideas are there, but it’s all wrapped up in neat, homely Americana. It’s also a novel about storytelling. The policemen of Troop D, not at all dissimilar to the prison guards of E Block in The Green Mile, gather around the son of one of their own in present day to share the story of a decades-old secret kept in storage shed B.
Troop D’s very own miracle-making John Coffey is a 1953 Buick Roadmaster, a car that even in real life has that repellent “Innsmouth look”. Indeed, there is something fishy about the vehicle. Left at a gas station in the seventies, Troop D soon discovers that the car is merely a prop. A prop that hums and puts on spectacular lightshows they dub “lightquakes”. But there’s more; occasionally the Buick “gives birth” to strange, unearthly creatures, appearing from the trunk and probably originating in another dimension. And people as well as gerbils that go too near the car go missing, presumably travelling in the opposite direction. It’s a far-fetched proposition, a Buick as a portal to other worlds, but it’s also quintessentially King. The policemen, like some guardians of an arcane secret, keep the Buick locked up and under observation for decades. From a Buick 8 is not an action-packed story; for the most part the Buick just sits there in its shed, with the cops peering in through the shed windows. It’s the mystery that drives the story, the weird, inexplicable nature of things “from beyond” that the smalltown cops could never even begin to comprehend. But they give it a brave try, and their camaraderie bestows the story with warmth in a way that only Stephen King can create. The policemen live, they retire, they die – as all men must. And the structure of the novel allows them to tell their tale with their own voice. It’s this kind of narrative choices that drive home the point that King is a seriously prodigious writer in full control of his craft.